We are now in the process of recruiting for our 2018 cohort of farm apprentices. 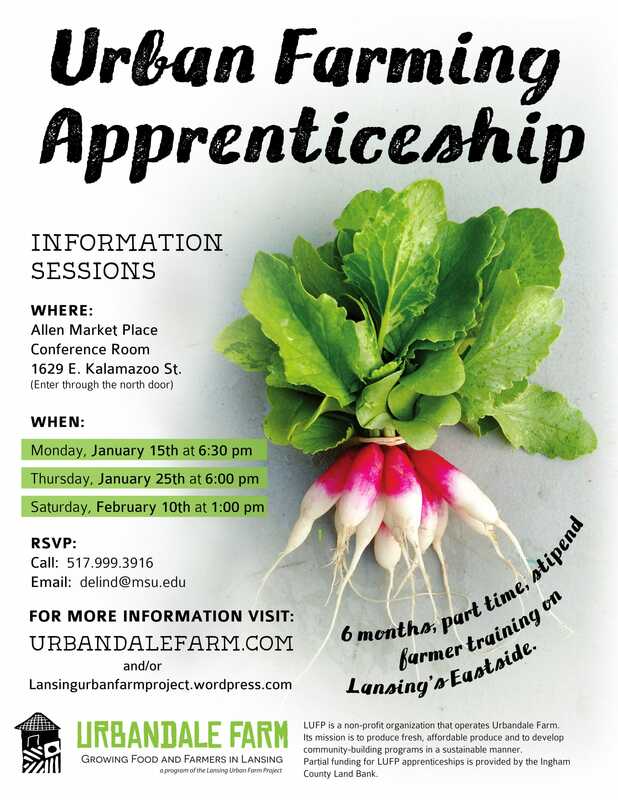 As in past years, this is a 6-month, hands-on program of training in urban agriculture. Apprentices will learn how to raise and market a wide variety of vegetables, flowers and herbs. We will be holding three informational meetings on at 6:30 p.m. on January 15th, at 6 p.m. on January 25th and at 1 p.m. on February 10th in the conference room at the Allen Market Place, 1629 E. Kalamazoo Street in Lansing. We will use the meetings to provide program details, answer questions and hand out application forms. Please help us spread the word.